This philosophy and meditation discussion will introduce students to yoga philosophy and meditation practices. Students will learn concepts from classical and traditional yoga philosophy and gain a better understanding of the philosophy that informs modern yoga and meditation practices. Students will also explore seated meditation postures, discuss different types of meditation, learn about concentration and meditation techniques, and the advanced meditation practice of Samadhi. This workshop culminates with a Shiva Meditation® practice. This workshop will explore the head balance practice. Students will learn why this is such an important practice in yoga. The workshop starts off with a brief philosophy discussion to help students understand the purpose of the head balance and why it is considered by many systems and styles of yoga to be one of the most important poses and practices in yoga. This is followed by an anatomy lesson and discussion, to help students better understand the physiology of the head balance. Students will learn about the muscles involved in balancing on the head in a bound head balance pose and a tripod head balance pose, and learn how to explore these inversions and find balance safely and with confidence. Balancing on the head is not just about brute strength! Students will also learn the rabbit pose and rabbit pose variations. Advanced bound head balance and tripod head balance variations will be taught for intermediate and advanced students. There will be modifications for beginners and preparation poses will be explored for those not ready to balance on their head yet. This workshop will explore the shoulderstand sequence. Students will learn why this is such an important practice in yoga. The workshop starts off with a brief philosophy discussion to help students understand the purpose of the shoulderstand sequence and why it is considered by many systems and styles of yoga to be one of the most important practices in yoga. This is followed by an anatomy lesson and discussion, to help students better understand the physiology of the shoulderstand, plow pose and the fish pose. Students will learn about the muscles involved in balancing on the shoulsers, and learn how to explore this inversion and sequence safely and with confidence. Advanced shoulderstand variations and transitions will be taught for intermediate and advanced students. There will be modifications for beginners and preparation poses will be explored for those not ready to balance on their shoulders yet. Garth is a 500hr E-RYT, Teacher Trainer, Yoga Therapist, Certified Yogaworks Teacher, Certified DharmaYoga Teacher and has led Classes, Workshops, Retreats and Teacher Trainings in Los Angeles and around the world. 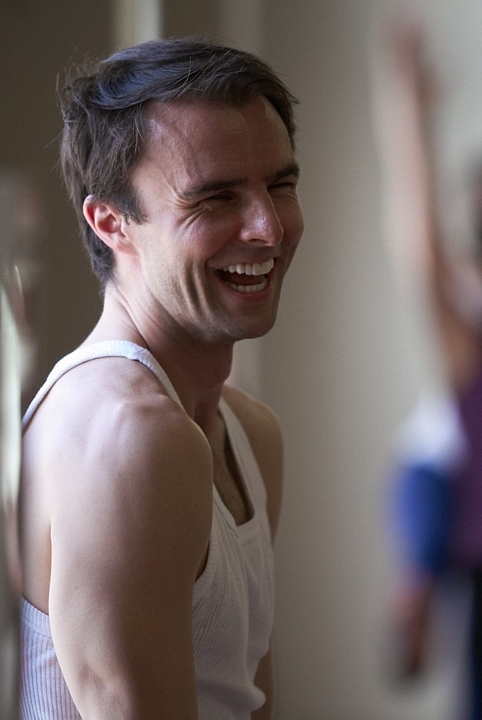 Garth taught for several years at the original Yogaworks in Santa Monica and at Exhale – The Center for Sacred Movement in Venice. He led the first Pure Yoga Teacher Training, in Los Angeles, at Equinox, with Ashley Turner. He has been featured in and contributed to; Yoga Journal, Men’s Health Magazine, Mantra Magazine, Yoganonymous, LA Yoga, Yoga in China and Shanghai Daily News. Garth completed teacher training at Yogaworks in Santa Monica with Annie Carpenter & James Brown, mentoring with Annie Carpenter, advanced teacher training at the Dharma Yoga Center in New York, with Sri Dharma Mittra and additional advanced teacher training at Loyola Marymount University, with Srivatsa Ramaswami. He has spent time in Mysore, India, studying Ashtanga Yoga, with the Sri K. Patthabi Jois family, practicing with Saraswati Jois. He also completed the Yoga Therapy Rx program, at Loyola Marymount University, with Dr. Larry Payne and completed Yoga Tune Up® teacher training, with Jill Miller. Garth is also the creator of the Shiva Yoga® system and the founder of the Yoga108Project. His signature Shiva Vinyasa® and Shiva Power® classes focus on setting intentions, practicing gratitude, concentration, surrender, balance, non-attachment, and quieting the mind. Garth also teaches Shiva Meditation® classes, as well as Pranayama and Yoga Nidra Guided Meditation classes, and sees students privately for Yoga Therapy sessions.